Several Robert Hitchams children are taking part in musical activities of a high standard. 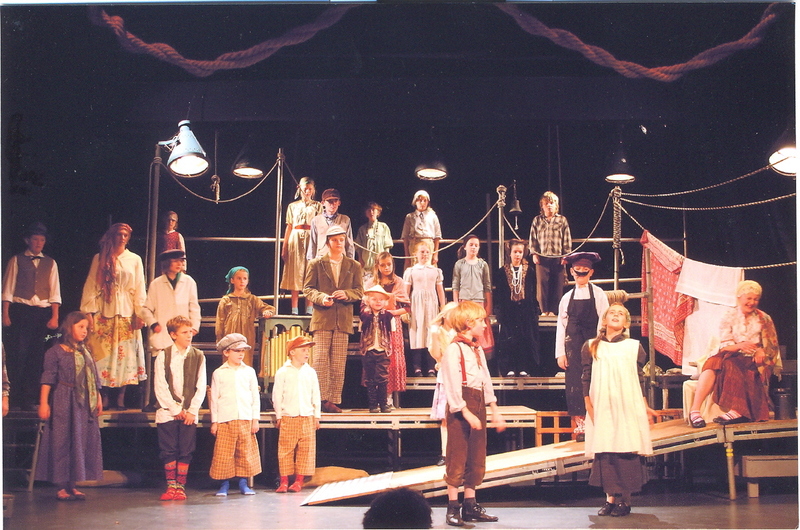 The JubileeTheatre in Aldeburgh has a junior choir which performs operas. Five of our children: Kitty, Maddy, Theo, Rachel and Isabel have recently taken part in an opera called 'Brundibar'. The Jubilee choir are holding auditions on 13th January for a production of 'Noah's Ark'. There will be a filming of the Brundibar performance at Aldeburgh cinema on 5th January. Kitty Dunham is multi talented and has become a member of the Suffolk Strings orchestra and the National Children's Choir. Please come to our Christmas Fair on Saturday. Our Christmas tree is now up and looking lovely. Displays are starting to go up around the school. Look out for pictures of the fair on the blog next week. Enclosed is the order form on which you can see photos, sizes and prices of the products. In addition we have set up a display board in the corridor near the office – do come and take a look. The deadline for returning the orders is Tuesday 11 December. Mr Byer's year 4 footballers have been practising hard on Wednesday lunchtimes. They wanted to play a match so issued a challenge to Year 5. Mr Brook selected a mixed team of boys and girls to give the year 4s an fair contest. The year 4 team scored 2 good goals in the first half through Charlie and Ryan. After a few half time substitutions the 2nd half was dominated by the year 5 team. William and Milo both scored to leave a final score of 2-2. Everybody left happy with the result and with a really good match. There is a huge amount of talent in year 4 which bodes well for our school teams over the next few years. This is a fantastic amount and a great effort from a village school. Well done everybody! A large crane arrived at school in order to lift some concrete beams onto the new building. On the first picture you can see the inside of the ground floor classroom. Lifting the beams from the lorry onto the building was like watching a giant gigsaw puzzle being put together. The whole process took about one and a half hours. The school has brought 13 new HP wide screen laptops. So far we have used them in many lessons such as geography (for research about the Aswan Dam in Eygpt) , English (for writing our own newspaper articles) and science (for looking at images of the Earth, Sun and Moon). The best thing about them is that they are wireless. The reason why they are better than old laptops is because they are quicker at loading things. By Hannah Bloomfield, Sophie Meynell-Anderson and Alice Prior! Mr Jenkins (our caretaker) worked with a group of year 6 boys to make a new compost bin. The wood was recycled from some old pallets. The boys also learnt how to use some tools and about which items can go into making compost. They started by putting in some of the leaves off the school playground as well as getting in it themselves! 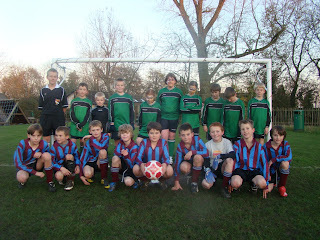 The annual primary school uni hoc tournament was held at Stradbrooke High School. Sir Robert Hitchams emerged as winners from the 10 teams taking part. Hitchams went through to the final to play the winners of the other group. The other group was very close with Debenham just beating Stonham on goal difference. In the final Hitchams played their best uni hoc of the day. Hannah, Sophie and Ewan (goal keeper) were outstanding in defence with Charlotte, Oliver and Danny getting lots of shots on the Debenham goal. Eventually the pressure told and Fram scored 2 excellent goals to finish the tournament as champions. Well done to the whole squad. Other players were Maddy, Clem, Marcus and Rachel. Robert Hitcham's football team continued their good run of form with a comprehensive victory in the High Suffolk Primary Schools Cup against Fressingfield. The game was played on 'Children in Need' day -some of the Fressingfield players still had teir Pudsey makeup on. Danny scored 7 goals this week and Oliver another 2. Dylan, Liam and Milo also got on the scoresheet. Final score 12-0 to Fram. This picture shows Milo running down the wing and about to pass to Danny. This photo is of a corner at the Fressingfield end. Charlie gets in a header which goes narrowly wide. The fun run in (fancy dress) is raising money for the children in need campaign and we did it round the school playground. All the classes have taken part in the fun run challenge. Most of us dressed up in some insane/strange clothes and we are hoping to raise a lot of money for children in need. We are very pleased to inform you that we have been successful in engaging Suffolk Coastal District Council in improving the safety at the Elms Car Park. Work is due to start on a new path with railings and dropped kerb at the entrance to the Elms car park (beside the cycle shop) in the week of 19 November. This is a direct result of the parent survey taken as part of our Travel Plan. The Friends of the School have asked that the children come in their own clothes in exchange for a donation of something that can be sold/won at the Christmas Fair on Saturday 1 December. For example, A Raffle Prize, a Promise to Bake a Cake (delivered to school 30 November or 1 December), Toys in good condition, Books, a Bottle for the Bottle Stall (all alcohol to be handed direct to a member of staff!) etc. Mrs Dwyer has had a boy and is calling him Thomas. He arrived on Friday 19 October and weighed in at around 4kg (8lb 11oz)! All are doing well. Mr Brook has some vacancies for help with reading in his class on a Tuesday 1.00-3.00pm and on a Thursday 1.00-2.00pm. If you are able to help either of these times please see Mr Brook directly. To help in school you do need either a ‘List 99 Check’ or a CRB Disclosure approval. If you have not applied for either of these, or wish to check if your name is already on the list, please contact the school office. If you have not seen ‘A Guide for Adults Helping in School’ they are available from the school office. One of our key Travel Plan objectives is to ‘Make children aware of and give them the skills required for Road Safety’. Class JC will be doing a practical Road Safety session on Thursday 22 October from 1-3pm. The aim is to familiarise the children with the area around school making special reference to the road environment. We will draw the children’s attention to safety features and safe approaches to the use of roads and pavements. They will learn: What are dangerous places and why these are dangerous; The skills and rules that help to keep them safe; Using their senses to help keep safe; The meaning of the words STOP, LOOK, LISTEN. Mrs Colchester would like some parent helpers for this session, please let her know if you can help. Thank you very much to everyone who donated and helped with these boxes. 56 boxes were passed to Link Romania for distribution. Thank you to everyone who has given us these tokens. We have managed to collect over 17,000. If you have still got some of these tokens please could they be posted at the school office by the end of November. On Tuesday 20 November photos of all individual children and family groupings will be taken. Please can you ensure that the children have their sweatshirts with them for the photograph. If you wish to bring pre-school children into school to join your family group photo, please come to the hall at 8.40am. SCHOOL BUS SERVICE – WHY DON’T YOU TRAVEL BY BUS? We would like to hear from ALL parents who live on or near to the school Bus routes. We believe there are many children who currently do NOT use this service. We are very keen to hear your reasons for NOT travelling by School Bus. Your feedback will be used to help determine any changes which may encourage more pupils to use this service. Please fill in the response slip below and return to the school office by the end of November. Thank you. Please tick/answer the questions below and return the slip to the Office by the end of November. How near do you live to a School Bus Stop? Is the walk to the Bus Stop from your home safe? If the walk to the stop is safe and not too far, why do you chose not to use the Bus? Our children have been invited to make a card at home to enter Framingham’s Annual Christmas Card Competition. Cards should be no bigger than A5 size and entrants must put their Name, Class, Age & School Name on the back. The winner and runner-up in each age group will be awarded a prize and certificate. ALL ENTRIES will be exhibited in the Unitarian Meeting House (next to library in Bridge Street) on Friday 14 December from 6.00-9.00pm during the Christmas Street Fayre. The all-singing, all dancing London-based Bassistry Arts Group ran a workshop in Fram School Hall that helped Hitcham learn rhythm and beat and put the whole school on their feet. Guitarist Marcel and drummer Sam, put on a spell-binding workshop that inspired children and teachers to sing and dance. "It was awesome," said children from class DB. "You walked in and you thought we're here to have fun - but what was really good was that we were learning stuff too," said Alfie and Will. And the atmosphere was cool too. "It looked like a concert because when we walked in they were already playing," said Emelia. In the two dayworkshop Bassistry taught song and dance routines to pupils and staff in an intensive musical experience. Marcel and Sam led a whole school assembly where everybody joined in a mass performance. Thanks to Mr Peter Warren for helping to write this report. He is a freelance journalist and a parent of a child in class DB. He came to speak to us about being a journalist so we asked him to help us write this article. We really like his headline. Mr Byer (we thought he had retired!) has been coming in to run lunchtime football for year 4 children on Wednesdays. He has also refeered our Friday school football matches and has been keeping his hand in with a bit of supply teaching. Its great to see him still involved in school life. There is rapid vertical progress this week. The builders are using the grey blocks for the internal wall, insulation and sandy coloured blocks matching the external wall of the existing building. Children from Sir Robert Hitcham's have made over 50 Operation Christmas boxes this year. This is very generous and a great effort by so many Framlingham families. Most importantly it is great news for 56 children who would not otherwise be receiving Christmas presents this year. Thank you for your generousity. The photo shows all the boxes from Framlingham and two of our children who took part. Remember that it is 'Children in Need' day this Friday. We will be having a sponsored fancy dress event. Look our for reports and images on this blog next week. After last week's disappointing performance against Debenham, everything clicked into place in this match. Fram went straight on the attack and Danny could have scored in the first few seconds. He soon scored the first of many goals (Danny scored 6) and the whole team grew in confidence. Fram led 3-0 at half time. In the second half we scored 6 more goals and played some excellent football. The score finished an amazing 9-0 to Fram. Next week we have a cup match away at Fressingfield. 6 of the best from Danny! Visits welcome please contact Jenny Elphick, the Headteacher at the school. Have you read a book which you would recommend to other children? Could you write a short review? Click here for our book review template. You can download a copy and fill it in on your own computer. You could then print it off or email it to the school (if you would like to include it on the school website) as an attachment. Watch out for reviews over the next few weeks. At Sir Robert Hitcham’s primary school we have two school council reps from every class. Once a month we have a meeting to discuss ideas about improving the school or events we want to happen. It is a big responsibility but very fun! Thomas Mills High School, Framlingham have put on a production of the famous Rogers & Hammerstein musical. Our Key Stage 2 pupils got to watch a matinee performance. Many staff, pupils and parents have also been to watch the evening performances. Several perfomers are ex pupils of Robert Hitchams so it was great to see them in action. Our year 6 children will be going to London in January to see 'The Sound of Music' at The Palladium Theatre.